We first published this recipe a year ago and it received a lot of attention. This recipe, as it is written (continued below), with the ingredients listed, is how we invented it. And how we tested it. If we had tested substitutions and found that they worked, we would have included that information. If you have allergies or dislikes, you need to test them yourself. We take great pride in our recipes, making them over and over again until they’re perfect. For that reason, we can’t recommend substitutions unless they go through the rigors of our test-kitchen protocol— given the number of dislikes and allergies people have, we’d never get a recipe finished. And eaten:) Please don’t ask about substitutions; get brave instead. Put your creative apron on and let our other readers know how it turned out with the substitutions you chose. And by the way, we will never publish a recipe that didn’t work for us. If it fails for you, something was different. Our recipes are tested over and over until we’re sure that if you follow our directions exactly and use the ingredients we list, you’ll be successful. My DIL Ashley, our food guru, has put together a list of FAQs for this recipe. Find it here. 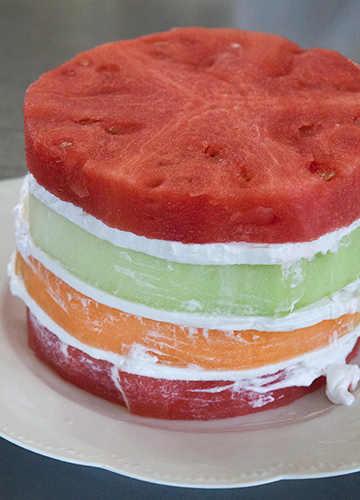 Come back next week for a coconut-free and nut-free watermelon cake. We used Native Forest full-fat (not low-fat) Organic Coconut Milk that gave us approx. half a can of cream from each can (that have been refrigerated overnight to firm up the cream), just like in the how-to photos. Please take a minute to look through them! 1. Stack all of the melon slices on top of each other, and cut inside the rind of the smallest round, creating four pieces of melon that are uniform in size. 2. 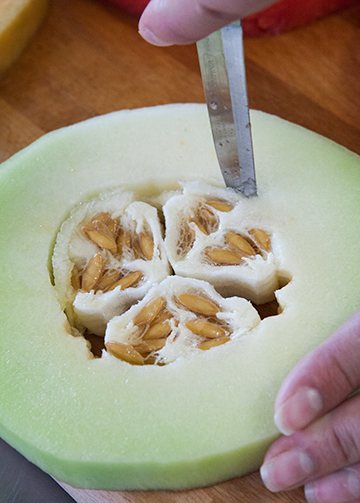 Remove the seeds from the cantaloupe and honeydew. Set melon slices aside. 3. Scoop the coconut cream off the top of the cans of coconut milk (discard milk from the bottom of the cans or use in soups or other recipes) and place in a medium bowl. 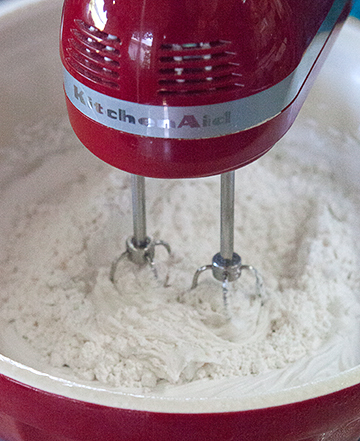 Using an electric mixer, mix until smooth. 4. Add powdered sugar and almond extract; mix until smooth. 5. Pat a slice of watermelon dry with a paper towel and place on a serving plate. Add a generous layer of coconut frosting. 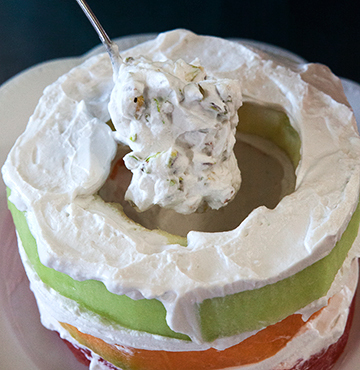 Pat cantaloupe dry and add to cake, add another generous layer of frosting, pat honeydew dry and add to cake. 6. 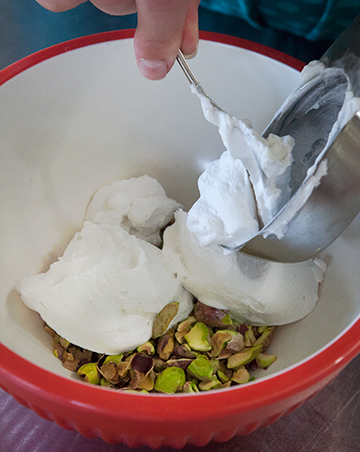 In a small bowl, combine ¼ cup pistachios and ¾ cup coconut frosting. Use it to fill in the center of the cantaloupe and honeydew. 7. 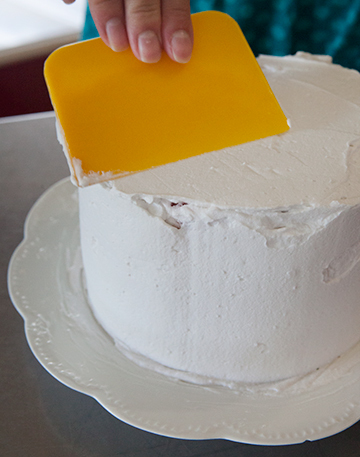 Add another generous layer of frosting. Pat the final slice of watermelon dry and add to the top of the cake. 8. 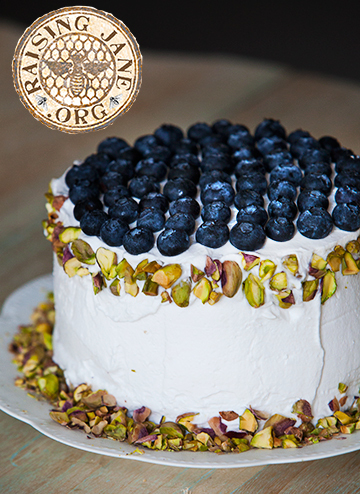 Frost the entire cake and garnish with remaining pistachios and blueberries. Chill for 2 hours before serving. 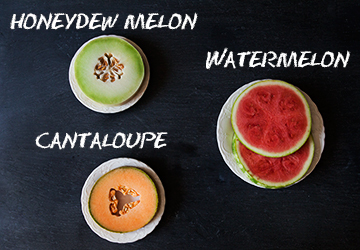 Stack two ¾” thick slices of watermelon, one ¾” thick slice of cantaloupe, and one ¾” thick slice of honeydew on top of each other, and cut inside the rind of the smallest round, creating four pieces of melon that are uniform in size. 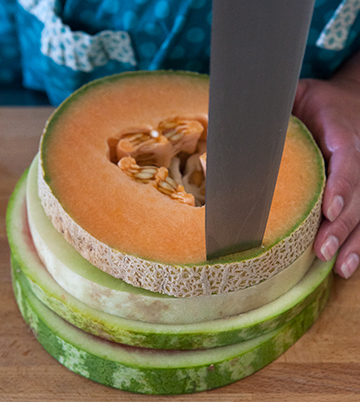 Remove the seeds from the cantaloupe and honeydew. Set melon slices aside. Scoop the coconut cream off the top of four 13.5 oz cans of coconut milk (that have been refrigerated overnight to firm up the cream) and place in a medium bowl (discard milk from the bottom of the cans or use in soups or other recipes). Using an electric mixer, mix until smooth. Add ¾ cup powdered sugar. Add ½ t almond extract. Mix until smooth. 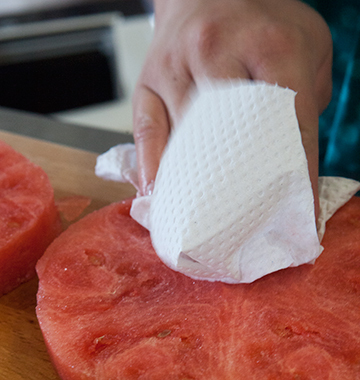 Pat a slice of watermelon dry with a paper towel and place on a serving plate. Add a generous layer of coconut frosting. 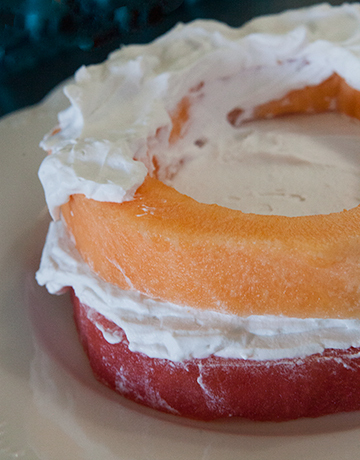 Pat cantaloupe dry and add to cake, add another generous layer of frosting. Pat honeydew dry and add to cake. Add ¼ cup shelled and chopped pistachios to a small bowl. Add ¾ cup coconut frosting; stir to combine. Use it to fill in the center of the cantaloupe and honeydew. Add another generous layer of frosting. Pat the final slice of watermelon dry and add to the top of the cake. 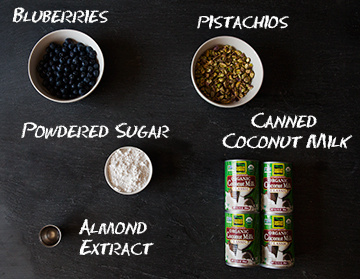 Garnish with remaining ½ cup shelled and chopped pistachios and ½ cup blueberries. Chill for 2 hours before serving. For more awesome recipes like this one, try my newly-released cookbook, Milk Cow Kitchen, or my magazine, MaryJanesFarm, now in its 13th year! Thank you for visiting my blog! This looks so good! I’m going to have to make this for my sister’s baby shower. :). Thanks for the step by step recipe! I don’t think I could have done this without your step by step photo’s, Thanks! This looks wonderful and healthy too. I cannot eat sugar, what do you suggest for an alternative? What kind of sweeteners can you eat? I think organic coconut granules are a good alternative. You could use Xylatol it is a all natural sweetner and it tasts just like sugar. Some side effects of xylitol are cramps and diarrhea. Small hard candies warn about this on the packaging. This looks beautiful! Nowadays everyone is trying to eat healthy and stay away from sweets so it’s really hard to do something for their birthday. Almost everyone likes fruit (or should! Lol). 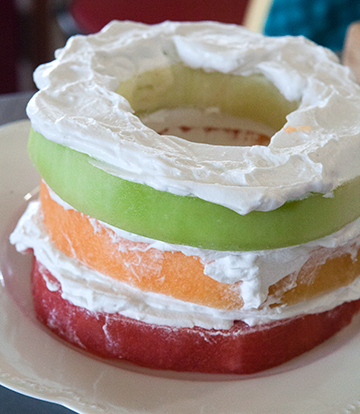 This would be the perfect birthday “cake” to make. Thanks for the wonderful idea!! ONLY if you eat a lot when you are new to it. So if you are, just don’t eat the entire cake ;), which you shouldn’t anyway, so it’s a great little extra motivation here for you lol. I have experienced it – I went x-happy and sweetened my tea with it and I like my tea very sweet in a very tall cup, so we are talking about 6 teaspoons lol. It was yummy but it cleansed me 😉 . Not pleasant, but not the end of the world either. If you are mindful of that side-effect, you never have to experience it. Please be careful when using Xylatol…. It is terminally Toxic to Dogs. It destroys their kidney and liver function. Very Deadly….. Keep away from dogs. I asked our Food Stylist, Ashley, what she thought and she suggested cornstarch instead of powdered sugar, but was concerned it may give the frosting a chalky texture. You could try sweetening with coconut sugar, if that’s something you are able to have. We didn’t make it with agave so we don’t know. Try it and let us know! What about coconut flour, or arrow root powder (bobs red mill) and one or two stevia packets? Mix those together and use in place of the powdered sugar so 3/4 cups total. You could try powdered erythritol or xylitol instead of sugar or any glucose containing sweetener. The regular granules don’t dissolve in cold things, so either buy it already powdered, or whiz it thru the blender. erythritol or xylitol are the most toxic sweeteners on the market and they can kill animals if eaten by them. Xylitol may kill dogs because their livers process it in a manner that CAN cause hypoglycemia or low blood sugar. Just as you wouldn’t give chocolate or grapes (xylitol) to a dog, they shouldn’t get xylitol. It’s from birch trees, has been used for oral hygiene, is known to re-mineralize teeth and has half the calories of sugar. Just don’t give it to dogs. Perfectly safe for humans in moderation-it can cause flatulance and diarrhea, especially if one goes overboard in consuming it. thanks for this clear info about Xylitol Maureen. I knew but never saw all the arguments together. Now I am gonna pass it on ! Stevia or Monk fruit in the Raw are good natural sweeteners. I use Monk fruit in place of sugar for almost everything now due to diabetes…it works great! Please tell me about Monk fruit. I have never heard of it. Why not sweeten it with pineapple juice? Sort of a pina colada flavor going on. Try it and let us know how it works? How about the new honey crystals? Nektar. Honey is very good for seasonal allergies and our immune system in general. 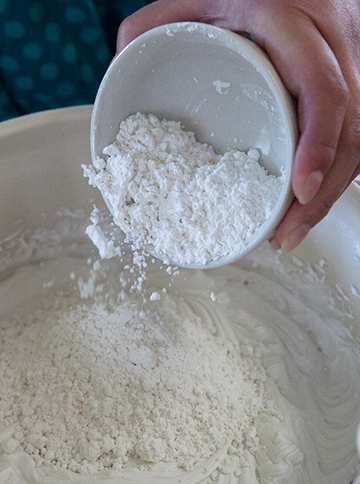 use corn starch instead of the powdered sugar and sweeten it with a substitute of your choice. You need the consistency of the powdered sugar to get the desired results however it will not be sweet. you may also have to add a little extra corn starch to compensate for and extra fluids if you use a juice as a sweetener. Can you use strawberries instead of blueberries? Dumb question! Anyways, this cake turned into a whole debate about sugar substitutes. WOW! Just make the damn cake and ENJOY it the way it is. That would definitely make your frosting too runny. I would also suggest using raw cashews. I don’t have the recipe off the top of my head, but if you look up Fully Raw Kristina on YouTube or Instagram, she’s got carrot cake recipes (ones for a full cake, the other for cupcakes) that use raw cashews and a few other things to make the frosting. They can also be used to make fully raw cheese, cheesecake – look up the Vegan Zombie for that on YouTube – and I’m sure a whole lot of other things. There’s really no need to further complicate things health wise for you by using processed/unnatural sweeteners. I am trying to figure out what to substitute for the coconut frosting….vanilla pudding made with heavy cream should do the trick???? I’m also going to incorporate strawberries and bananas with that mixture for the middle but I am not a cook and need to know if this will work! Wegmans in the all natural section has a coconut version of cool whip it is OUTSTANDING OMG !!!! and it has 3 grams sugar 25 calories o colosteral and tasts soooo good. You can actually buy a completely sugar free fat free cool whip. I use it for my daughter, & add fat free cream cheese to make a dip with. The marshmallow fluff is the only thing I have trouble finding sugar free, it is fat free though. I would think using the cool whip & cream cheese will be thick enough. I mix them both semi frozen. You could still throw in the coconut cream too, just blend them well. Possibly slightly re freeze before you ice. Or use the corn starch with cool whip we just enjoy the fat free cream cheese to thicken. Add 1pkg of cream cheese to 1. Tub cool whip. Flavor to your liking. Will be icing texture. And holds well! Ha! And your substitution of cool whip is not harmful? If you can eat raw honey, all you need is 1TBSP/per can. Otherwise, with all of this fruit you really do not need a sweetener. I use make mine with just some vanilla bean all of the time while omitting any sweetener. Stevia is very sweet, so try to taste in a little bowl. Sweeten the coconut milk with Stevia. I use an oil, that I sweeten up many foods with. Ice tea, yogurt, lemon(water)ade, choc almond milk(Hot chocolate) Love this recipe, can’t wait to make, and I will be making Sugar-free!! Susan, try Truvia. It is specifically designed for diabetics and I have been using it for over a year and do not experience any sugar spikes or any other adverse effects. And I use the bakers version, its sold in most grocery stores here in FL for about $5.95-$6.69 for a 1lb bag. I wonder how it would work with light cool whip as the frosting? Might not be stiff enough to hold the layers together though. I would try a little honey in this recipe…that is if you are not Diabetic. I can’t have sugar and I can do honey and maple syrup for sugar but I have celiac disease. I tried 1 large box diet instant vanilla -no milk but instead mix with 8 oz sour cream and 1 lg can un- drained crushed pineapple for filling and sugar free cool whip for the frosting it was great just didn’t put any nuts only berries on the top! This cake looks wonderful. Will definitely have to try it. I’ve GOT to try this! Wow….yummy! it would be great to have these as a downloadable pdf file as well! that would make saving them easier. especially with the great photos. I just add this page to my favorite and everytrhing is there for me to use when I make this, just an idea. OMGosh…looks so yummy, can’t wait until payday to go get all the goodies and make this!! If anyone needs a taste tester- I’m in. As you can see in the photos, we used Native Forest full-fat Organic Coconut Milk. We did not try non-organic coconut milks or cartons of coconut milk or low-fat coconut milk because we felt they wouldn’t work. When it’s been refrigerated overnight, about half of the can is firm, just like you see in the photos. 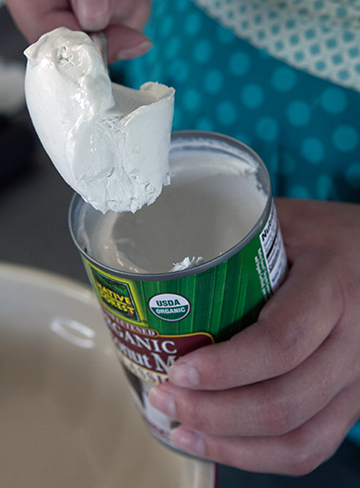 Did your can of coconut milk give you about half a can of firm milk like in the photo? I think I made the mistake of shaking the cans prior to refrigeration last night because after opening 2 cans, all I have is thick “cream” and have concluded I have to run to the store, pick up 4 new cans, and start the process all over again. I have used the electric mixer on the 2 cans of coconut milk and to no avail. Any suggestions? Try different brands of coconut cream / milk – they vary hugely. Some just won’t work, some will give you half a can of solid creamy stuff to work with, and some will almost completely solidify. okay, I have tried this a couple of times based on this and other recipes on the internet. my coconut milk does indeed get half a can of solid (hard almost like a rock!) stuff on top. I pry it out of the can. I put it in the stand mixer. I whip it and it turns into little blobs of hard coconut milk… I finally tried adding some cornstarch & sugar (a few teaspoons) and whipping some more. I have a liquidy goo with small hard lumps in it. too runny to spread. it doesn’t whip up. ….. clearly i’m doing something wrong. I don’t get something that I could call ‘smooth’ to reach that stage you show before adding sugar, and once I go ahead and add sugar afterwards it just gets runny. not sure I can afford to keep experimenting with coconut milk at nearly $3 a can!!!! but I think a traditional buttercream would be pretty gross with this fruit item and was looking forward to coconut. how long should I have to whip it? 10 minutes? 20? 2? I would like to trythis with whipped cream. Forest organic coconut milk too! I did not add cornstarch. I thought I would need to whip it more. well, the more that I whipped it the more it separated! It reminded me of how whipping cream can turn into butter when it is whipped too much. So, I thought I ‘You can make frosting with butter-buttercream frosting’. I proceeded to whip the coconut cream until they were separated enough to gather the “butter” from the mix. I proceeded to whip that, it became very smooth but never ‘whipped’ liked whipping cream. I was able to frost the melon with this, but it diminished the amount to work with and I had to skimp on the amount in the layers and the sides (like allowing the mellon to peak through). It is VERY rich as it is almost pure saturated fat. It would be better if I could have gotten in to be litter and fluffier like whipped cream! Maybe next time I will try to let the cream to warm up a touch before I whip it. from the photo this website pictured their cream looks much softer coming out of the can than what I had. Oh! -and I used full fat too! I found a new product at our co-op recently called Coconut Milk Yogurt Alternative by COYO, http://www.coyo.us in Albuquerque, NM. It’s sold in plastic containers with 5.3 oz in each. It was SUPER thick and creamy like Greek yogurt, only much thicker and more solid. I haven’t had a chance to try it in our cake idea but I think it might work. If someone has a minute to try it, let me know. This is beautiful, I hope to have the chance to try it sometime soon! Cream cheese might work as a thick frosting base also if we can’t find the full fat coconut milk. I will have to search for that locally. I was thinking to try it with a strawberry cream cheese blend instead of using the coconut milk for the entire thing and just put the coconut filling with the nuts in the middle. there something I could sub for it? Try hazelnut or vanilla extract. Thanks for the tip on the artificial almond extract being nut free. I just found out I am very allergic to almonds after eating them all my life. I have no idea if that will work. Give it a try. I let the cocobut milk sit in the fridge for 24 hours. It never really thickened. So we did plan B. I added the powdered sugar and almond extract and we decided to use it as a “sauce” for cube melon. With the extra, we froze it and will gave granada (sp?). I will say this isreally, REALLY good!! 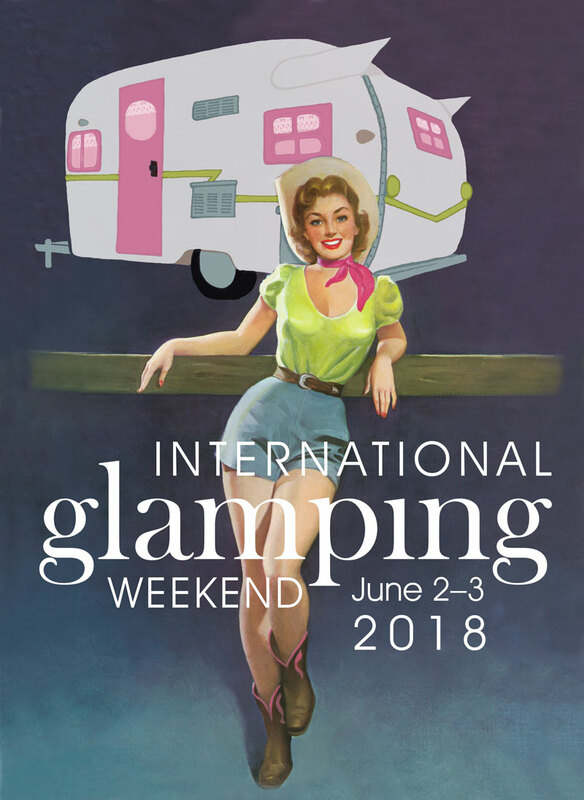 What brand did you use? Just curious. No coconut oil will not replace the coconut cream. Coconut oil has a stronger flavor than the milk does. My brother-in-law hates coconut and we have found that he can ALWAYS taste when we put the oil in a recipe but he can’t always taste the milk. If you aren’t opposed to dairy use heavy cream and or cream cheese. No:) coconut oil, coconut butter, and coconut milk all are different. You don’t want to eat a coconut oil frosted cake, believe me. Thank you for such an awesome recipe. My sister has severe allergies to nuts and dairy do you think I’d be able to do it without the nuts or even possible substitute with another fruit? Sooooo amazing though! I am just so pleased!!! It could be made without the nuts. 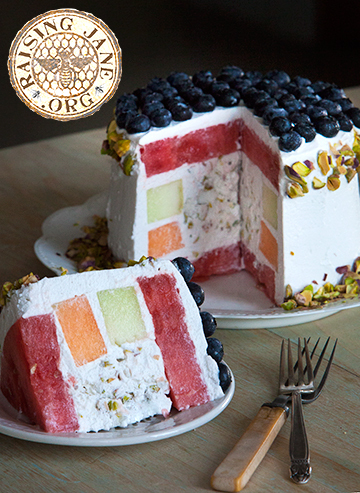 You probably would want to add fruit to the filling in place of the pistachios, the coconut frosting would be a bit overpowering in the center without something else inside. Have you ever had a problem with the fruit slipping off the icing? Is the fruit slipping before or after frosting? We didn’t have any problems once the cake was assembled. During assembly, if the melons have too much moisture on them, the frosting will slip. Be sure to pat melons dry with a paper towel before frosting. Wondering how far in advance this can be made. I’d love to make it for Father’s Day, but won’t have time that day. Can it stay in the refrigerator for 24 hours before an outdoor party? Wow, this is awesome- but why not just buy coconut cream? Can I make this the day before and keep it in the refrigerator overnight? I am not a fan of coconut, do you have any other suggestions or recipe I could use instead? I was going to make it with a cream cheese, Marshmellow fluff, vanilla mixture I use as a fruit dip anyways! Mmmm! Can’t wait 2 try4 daughterz b’day/Graduation party!!!! For those that have an allergy to the coconut or do not like the taste maybe they could use a stablized whipping cream instead. Cant wait to try! This looks so different! This looks awesome. My son was curious to know if he could eat cake every day and of course we discovered the unhealthy consequences. However, this cake has exactly what i was looking for. I’ll surprise him for his 4th birthday. You can find coconut cream in any grocery store. Usually in the ethnic foods isle. Shake the can though. If it shakes right away with liquid, it isn’t creamy enough. it should seem solid when you shake it. There are usually 2 to 3 types to choose from. 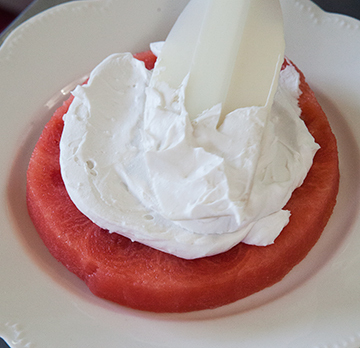 I dollop of sour cream in the whipped cream will also stabalize it – I trick my mother taught me! Magnificent. Will be in a cabin this week spending the weekend with great friends and will make this for desert… It looks YUMMIE. thank you so much. Wondering what i can use instead of coconut. Milk . 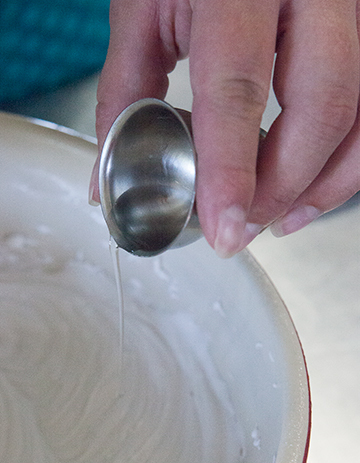 condensed milk won’t do what coconut milk does — there will not be a hard cream layer that separates. If you get heavy whipping cream and whip it up that is more likely to make a good dairy substitute. That I will try, it looks delicious. Well. That is just brilliant. Fresh pineapple rings!! I am allergic to that nut, I am wondering if anyone had tried a substitute like maybe almonds? I was thinking you can use marshmallow cream and cream cheese as the frosting. We use it for a fruit dip all the time. I was thinking cool whip, cream cheese and powdered sugar. Yum, if you’re concerned about the sugar, moderation is the key or don’t eat it!